October is the perfect month for casting spells. Well, it's the perfect month for newbies to want to cast spells. Seasoned professionals cast spells year-round, but in Black Magick from Image Comics, things get a little more interesting as far as magic in October goes. Written by Greg Rucka and illustrated by Nicola Scott, Black Magick is a new gothic-noir ongoing series about legacy, destiny, redemption… and the price of magic. In Black Magick #1 Detective Rowan Black works robbery/homicide for the Portsmouth PD, but her greatest mystery is the truth about herself… both who she has been, and who she will become. Yet, there are others in Rowan's world with very long memories, and the power that one person holds, another will always covet. Black Magick #1 (Diamond Code: AUG150553) will be available on Wednesday, October 28th; cover B by Jill Thompson will be available with Diamond Code AUG150554. A magazine-size variant by Rich Burchett will also be available with Diamond Code AUG158533. The Final Order cutoff deadline for retailers is Monday, October 5th. New York Times bestselling and Eisner Award-winning writer Greg Rucka (LAZARUS, Stumptown, Gotham Central) and superstar artist Nicola Scott (Birds of Prey, Secret Six, Earth 2) team up for BLACK MAGICK—a new gothic-noir ongoing series about legacy, destiny, redemption… and the price of magic. The new series was first announced at Image Expo and launches from Image Comics on Wednesday, October 28th, just in time for Halloween. In BLACK MAGICK #1 Detective Rowan Black works robbery/homicide for the Portsmouth PD, but her greatest mystery is the truth about herself… both who she has been, and who she will become. Yet, there are others in Rowan's world with very long memories, and the power that one person holds, another will always covet. 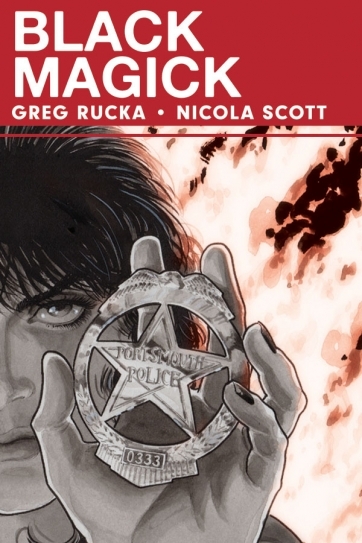 Steeped in mystery, suspense, the many myths of witchcraft, and Wiccan tradition, each issue of BLACK MAGICK will also feature an all-new work of original fiction by Greg Rucka. BLACK MAGICK #1 (Diamond Code: AUG150553) will be available on Wednesday, October 28th. Cover B by Jill Thompson will be available with Diamond Code AUG150554. A magazine-size variant by Rich Burchett will also be available with Diamond Code AUG158533. The Final Order cutoff deadline for retailers is Monday, October 5th.